The scout who initially evaluated Tim Tebow for the Mets was apparently so unenthused about the former Heisman Trophy winner that he didn’t even want his name used in connection with Tebow. That insight comes courtesy of Mets General Manager Sandy Alderson who, at a convention for the Society of American Baseball Research (SABR), told those in attendance that since Tebow was being signed against the recommendation of the scout, the organization decided to list the Mets marketing director as his signing scout in the media guide. Alderson’s admission will no doubt herald a chorus of Tebow-haters in the sports media, as they celebrate what is, to them, confirmation that the Tebow signing constitutes nothing more than a marketing ploy from an opportunistic franchise with a bankrupt owner. And you know what? Maybe they’re right. Maybe, to the Mets, Tebow is nothing more than a cash grab. But so what? At least Tim Tebow has the ability to make money. Where was the chorus of disapproval from the sports media when the Dallas Cowboys signed a completely undeserving Michael Sam to their practice squad, just to shield the NFL from taking a PR hit? If the Cowboys can sign Sam to avoid bad PR, why can’t the Mets sign Tebow in order to have good PR? The reason why Tebow moves merchandise is because people like and buy in to who he is and what he represents. How much money did Michael Sam ever make anyone? By the way, Tebow has shown some adeptness at moving things other than merchandise lately. 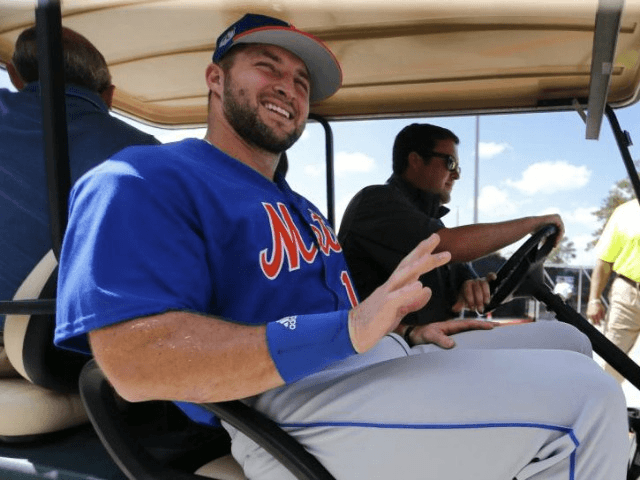 Since getting called up to High A-ball at Port St. Lucie, Tebow is hitting .429, with three walks, a homerun, and two RBI’s.